The Clarence J. Brown reservoir in Springfield, Ohio is near the place where I grew up. It has a large spillway that decades ago featured a spray painted Snoopy and Woodstock along with the words “We Love Park People.” Today, I got to spend some time with a lot of park people and I have to say I loved it. 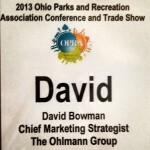 I was a speaker at the 2013 Ohio Parks and Recreation Conference, where I was invited to speak about how parks can use social media. The presentation was a lot of fun to put together. I chose to explore that idea that public parks are the original social media, pioneered long before Brin, Dorsey, and Zuck, by people like Mather, Muir, and Roosevelt. Facebook, Twitter and the like are merely modern extensions of the idea of the public park – a place where we can freely and easily gather, connect, learn, share, and have enjoyable experiences. My premise is that for a parks system, social media should be managed as if it were in fact another park in the system – one with unique features and aspects. A traditional park is governed largely by the sun. We are all familiar with the “park closes at dusk” sign. Digital media, however is not bound by daylight, nor by geography, weather, or other constraints that can place limitations on physical parks. Where physical parks excel is the experience of actually being there, doing, touching, feeling, smelling, and seeing life pass by first hand. However, in the case of people who work during the day all week, an online park experience can bring the experience of the parks into a home. No, it is not the same, but it is similar. This peaks interest, feeds imagination, and offers a reason for people to later use their free time to actually visit and participate in the physical parks. Just like parks, social media requires more than just throwing up a sign on a piece of property. The best parks have leaders, managers, vision, employees, budgets, marketing, and exist to serve specific needs of people. This includes education, conservation, connection, socialization, entertainment, and more – all of which require a planning, programming, and effort. Just like a community would not just open a park system and wing it, they should approach social media in the same fashion. It’s an ongoing process. In the end treating social media like a park unto itself can help a park system to more deeply connect with people in the community and help them forge connections with one another, thus creating greater value. The presentation slides are embedded here. They don’t feature a lot of words, as I generally like to just speak and let the slides be my guide. They do feature some really bad post-it drawings that I made, took pictures of, and included for illustrative purposes, so that’s fun. 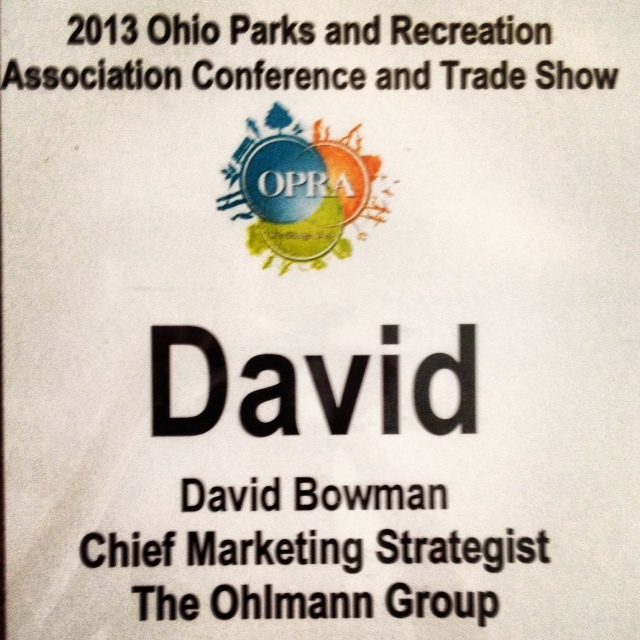 I want to thank OPRA and all who attended my presentation today. I had a great time, met some nice people, saw an old friend (who was featured in one slide) and thought some new thoughts – all are good. It was an honor to present. I hope you enjoyed it. Thanks park people for showing me the love today!